Craniofacial reconstruction refers to a group of procedures used to repair or reshape the face and skull of a living person, or to create a replica of the head and face of a dead or missing person. The word "craniofacial" is a combination of "cranium," which is the medical word for the upper portion of the skull, and facial. Craniofacial reconstruction is sometimes called orbital-craniofacial surgery; "orbital" refers to the name of the bony cavity in the face that surrounds the eyeball. Photograph by Alexander Tsiaras. Science Source/Photo Researchers. Reproduced by permission. in question. In children, craniofacial reconstruction is done to repair abnormalities in the shape of the child's skull and facial features resulting from birth defects or genetic disorders. It is also done to repair traumatic injuries resulting from accidents or child abuse. Craniofacial reconstruction in children requires special techniques and planning because the surgeon must allow for future growth of the child's facial bones and skull. In adults, craniofacial reconstruction is most commonly done following head or facial trauma, but it is also performed on cancer patients who have lost part of the bony structures or soft tissue of the face following tumor surgery. In both adults and children, the reconstruction is intended to restore the functioning of the patient's mouth, jaw, and sensory organs as well as improve his or her appearance. Craniofacial reconstruction is a complicated procedure because the surgeon is operating on a part of the body that contains the brain and upper part of the spinal cord, the eyes, and other sensory organs, and the opening of the patient's airway—all within a small space. The third major application of craniofacial reconstruction is in forensic medicine and anthropology. Forensic is a term that refers to legal matters. Physicians who specialize in forensic science study the remains of people who have died to establish not only the cause of death but in some cases, the identity of the dead person. 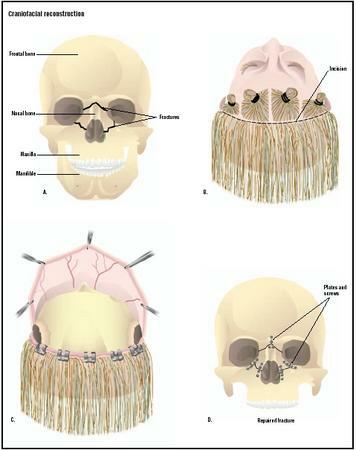 Craniofacial reconstruction is one approach to this identification. Anthropologists, the scientists who study the origins and cultural development of humans, make use of craniofacial reconstruction to understand what prehistoric people looked like and to compare them with present-day humans. About 7%, or 227,500, of the children born each year in the United States are affected by birth defects of the head and face. According to the American Society of Plastic Surgeons, 37,732 procedures were performed to repair birth defects in 2001, an increase of 2% over the number of surgeries in 2000. Cleft palate. Cleft lip or palate is the fourth most common birth defect affecting American children, one in every 700 newborns. The male:female ratio is 2:1 in children of all races. Asian-American children have a higher than average incidence of cleft palate, while African-American children have a lower than average incidence. Down syndrome. Down syndrome is the most common congenital disorder caused by a chromosomal abnormality; it occurs in one in every 900 infants. Children with Down syndrome have facial characteristics that typically include slanted eyes, a flattened nasal bridge, small rounded ears, and a large protruding tongue. There are about 350,000 people in the United States with Down syndrome. Treacher Collins syndrome. This congenital disorder is caused by a mutation on human chromosome 5 that can arise spontaneously or be inherited from the parents. The craniofacial abnormalities in Treacher Collins include an abnormally small jaw and airway that can cause breathing problems; the ears may also be malformed or missing. Treacher Collins syndrome affects one in every 10,000 infants. Apert and Crouzon syndromes. These two disorders are sometimes grouped together because they are both characterized by craniosynostosis, which is the medical term for premature closing of the sutures (seams) in the bones at the top of the skull. Children with these syndromes have misshapen heads and a sunken-in appearance to the face. They also have breathing problems and malpositioning of the teeth caused by deformed facial bones. Apert syndrome is very rare, affecting only one child in every 150,000. Crouzon syndrome occurs in one out of every 25,000 infants. Traumatic injuries to the face and head can include blunt trauma, lacerations (tears), and burns. Heat, chemicals, or electricity may cause burns. According to the American Burn Institute, there are 1.1 million burn injuries each year in the United States that are serious enough to require medical treatment. In 2001, 16,879 adults needed plastic surgery to repair burn injuries, while 24,298 required maxillofacial surgery for injuries to the face and jaw. Prior to the early 1980s, when more rigorous seat belt laws were passed, most severe facial injuries in the United States resulted from automobile accidents. As of 2003, however, 70% of facial injuries treated in urban hospitals are caused by assaults; at least 10% of fractured facial bones in women are the result of domestic violence. Falls cause a significant number of facial injuries in small children and the elderly. Another common source of facial trauma in children is animal bites. Cancers of the head and neck affect about 55,000 Americans each year; about 13,000 of these patients die. These cancers include cancers of the skin of the face, the esophagus, the larynx (voice box), the mouth, and the nasal passages. Most of these cancers are preventable because they result from prolonged exposure to either sunlight (facial skin) or tobacco (mouth, throat, nose, and larynx). Men are two to four times as likely to develop cancers of the mouth and throat as women. Craniofacial reconstruction dates back to the late nineteenth century, when doctors in Germany and France first used it to produce more accurate images of the faces of certain famous people who had died before the invention of photography. Early craniofacial reconstructions included those of Bach, Dante, Kant, and Raphael. The technique was then applied to reconstructing the appearance of prehistoric humans for museums and research institutions. An important contribution to the field was the publication in 1901 of three major papers on the classification of facial fractures by René Le Fort, a French surgeon. Le Fort identified the lines of weakness in the facial bones where fractures are most likely to occur. Traumatic injuries of the facial bones are still classified as Le Fort I, II, and III fractures. A Le Fort I fracture runs across the maxilla, or upper jaw; a Le Fort II fracture is pyramidal in shape, breaking the cheekbone below the orbit (eye socket) and running across the bridge of the nose; a Le Fort III fracture separates the frontal bone behind the forehead from the zygoma (cheekbone) as well as breaking the nasal bridge. A Le Fort III fracture is sometimes called a craniofacial separation. In the 1920s, British physicians pioneered the application of facial reconstruction to unsolved criminal cases and to treating World War I veterans who had been disfigured in combat. Prior to the invention of the computer, craniofacial reconstruction was done either by applying soft clay to the skull (or a cast of the skull) to recreate the person's features, or by making a two-dimensional drawing over a photograph or x-ray picture of the skull. It was difficult for surgeons operating on mutilated patients to predict the outcome of the operation from these two-dimensional sketches. The first attempts at craniofacial reconstruction in children with congenital abnormalities were made in the late 1940s by Sir Harold Gillies, a British plastic surgeon who had treated disfigured World War II veterans. More recent advances in craniofacial reconstruction include improved understanding of the soft tissues of the face and better surgical techniques for repairing injuries to these tissues; the invention of surgical plastics that can be used instead of bone grafts to fill in missing pieces of bone; new techniques for fixing the facial bones in place during the healing process; and computerized imaging programs that help the surgeon analyze the patient's facial abnormality or injury. Some of these programs allow doctors to download data directly from x rays, computed tomography (CT) scans, or other diagnostic imaging programs in order to plan the operation and have a clearer picture of the results. In the case of children, computer imaging can be used to estimate the future growth lines of a child's skull and facial bones as well as his or her present condition. Orthodontists and other dental specialists have developed additional imaging programs that provide more details about the mouth and jaw area than can be obtained from CT scans and x-ray studies. Craniofacial reconstruction in children with congenital abnormalities of the head and face is preceded by a consultation between the surgeon, other specialists, and the child's parents. It is important to determine the exact cause of the child's deformities, since some abnormalities may be found in as many as 150 different genetic disorders. Following the diagnosis, a comprehensive treatment plan is made that includes long-term psychosocial as well as surgical follow-up. Craniofacial reconstruction in children is complex because the surgeon must allow for changes in the proportions of the child's face and skull as he or she matures as well as attempt to make the facial features look as normal as possible. It is difficult to provide a general description of craniofacial surgery in children because there are many variables among children diagnosed with the same disorder as well as a large number of different disorders requiring craniofacial reconstruction. Reconstructions in children, however, are always done under general anesthesia and usually take between three and six hours to complete. Craniofacial reconstruction following trauma is a highly individualized process, depending on the nature and location of the patient's injuries. Emergency workers are trained to evaluate and clear the patient's airway before treating facial injuries as such; severe injuries to the midface and lower face frequently result in airway blockage caused by blood, loose teeth or bone fragments, or the tongue falling backward toward the windpipe. The trauma team may have to intubate the patient or perform an emergency cricothyroidotomy in order to help the patient breathe. The second priority in treating traumatic facial injuries is controlling severe bleeding. Imaging studies of craniofacial injuries may need to be postponed for 24–72 hours in order to treat injuries to other organ systems. Over 60% of patients with severe facial trauma have other serious injuries in the head, chest, or abdomen; this high rate reflects the tremendous forces needed to fracture the human frontal bone, zygoma, and maxilla. In particular, a doctor who is examining a patient with severe facial trauma will be particularly concerned about damage to the brain, the spinal column in the neck region, and the eyes. All Le Fort II and III fractures have the potential for permanent damage to the eyes. There are specific maneuvers that the doctor can perform to assess the location and severity of bone fractures, possible dislocation of the jaw, and injury to the eyes and nose before taking an x ray or CT scan. When the patient is out of immediate danger, x-ray studies and computed tomography (CT) scans are taken of the craniofacial injuries. Three-dimensional scans assist the surgeon in analyzing the fractures and the condition of the other structures in the face and head. Imaging studies can be used to generate computer images for plastic or metal implants to be matched to the patient's injuries for filling in sections of missing bone. Surgery following facial trauma may take as long as four to 14 hours, as the goal is to repair as much as possible in one operation. The surgeon may use bone grafts, taking bone from other parts of the body to repair the facial bones, or fill in smaller areas of missing bone with hydroxyapatite cement or polymer implants. Broken facial bones are held in place with titanium miniplates and surgical screws. This technique is called rigid fixation; it often does away with the need to wire the jaws in place, and it speeds the patient's recovery. Lacerations (tears) in the skin are usually simply closed with stitches, although the surgeon will be careful to minimize scarring. If large areas of skin are missing, the surgeon will cut a flap, which is a section of living tissue carrying its own blood supply, from another area of the patient's body and transplant it to the face. Some facial injuries may require the assistance of a neurosurgeon, oral surgeon, or ophthalmologist. Cancers on the skin of the face are usually removed and closed with a few stitches, although skin flaps may be required if the area of the face that is affected is large. Cancers of the head or neck may require bone grafts as well as skin flaps after the tumor has been removed. Reconstructive surgery after cancer treatment may involve the use of a microscope and special instruments to rejoin the facial blood vessels and nerve fibers. This technique, which is known as microsurgery , is done to preserve the function of the muscles in the face as well as restoring the patient's appearance as much as possible. Diagnosis of the need for craniofacial reconstruction depends on the cause of the abnormality, injury, or disfigurement. The obstetrician or the child's pediatrician will often make the diagnosis of craniofacial abnormalities in children at the time of delivery. Some genetic disorders that are associated with congenital facial abnormalities, including Down syndrome and Treacher Collins syndrome, can be detected before birth by chromosomal analysis. In adults, the diagnosis is usually made by trauma surgeons in the emergency room or by physicians who have treated the patient for cancer. Imaging studies, including x-ray photographs, CT scans, and magnetic resonance imaging (MRI), are used to analyze the patient's abnormalities or injuries before the operation in order to plan the surgery. The surgeon may also consult a neurosurgeon or ophthalmologist if the abnormality or injury involves the functioning of the patient's brain, spinal cord, or eyes. Children who have had reconstructive surgery for congenital abnormalities are usually taken to a pediatric intensive care unit for a day or two, and remain in the hospital for a total of four to five days. Adults who have had reconstructive surgery following trauma may be monitored in an intensive care unit for one to two days after the operation, particularly if they required special treatment for airway problems. The total length of the hospital stay varies according to the severity of the patient's other injuries; some burn victims may be hospitalized for several months. Short-term aftercare includes medications for pain, changes of surgical dressings, breathing exercises, and antibiotics to reduce the possibility of infection. Patients with injuries to the jaw or mouth may be given special semi-liquid or soft diets. Children are restricted from swimming for two months after reconstructive surgery and from more active sports for six months. Long-term follow-up may include revision surgery six to 12 months after facial trauma. In the case of children, the patient will be followed until his or her growth is complete; most will need periodic consultations with an orthodontist as well as with the plastic surgeon. A dentist or an oral surgeon should check on patients who have had craniofacial surgery following trauma during their recovery to make sure that the teeth and jawbones are in proper alignment. All Le Fort fractures (I, II, and III) involve damage to the patient's normal occlusion (bite pattern). Some patients may choose to have cosmetic surgery to remove or minimize facial scars after healing is complete, usually about six months after the reconstructive operation. The psychological aftereffects of a disfiguring congenital abnormality or post-traumatic injury are often problematic. Craniofacial reconstruction in children with congenital syndromes typically includes ongoing psychological assessment and counseling to help the parents as well as the child cope with feelings of guilt as well as deal with teasing or ridicule from others. Many parents blame themselves for their child's condition if it is associated with a genetic disorder. Children who have had a disfiguring injury often develop post-traumatic stress disorder (PTSD), depression, or anxiety. One study found that 98% of children between the ages of three and 12 who had been disfigured by accidents or dog bites had symptoms of PTSD within five days of the traumatic event. A year later, 44% of the children still had symptoms, and 21% met the full diagnostic criteria for PTSD. Psychiatric symptoms in children are often intensified as the youngsters reach adolescence and become even more preoccupied with their appearance. Adult patients also have high rates of depression, PTSD, or anxiety disorders following craniofacial reconstruction. Support groups as well as individual psychotherapy appear to be effective in helping people learn to live with disfiguring injuries or the aftermath of cancer surgery. Specific concerns include coping with awkward social situations as well as internal feelings of guilt or anger. Some researchers have reported that men find it harder to adjust to facial disfigurement than women, possibly because males in Western societies are not encouraged to discuss concerns about their appearance. Risks that are specific to craniofacial reconstruction include damage to the nerves in the face and head; visible scarring; bone graft failure; and the need for further surgery. Normal results of craniofacial reconstruction vary, depending on the type of injury or defect. Good results include improvement or restoration of the general shape of the patient's head or face; improving or maintaining the functioning of the eyes, ears, nose, mouth, and teeth; and a more nearly normal appearance to the face. Morbidity and mortality rates vary widely, depending on the patient's age, general health, and the cause of the injury or abnormality. There are no mainstream alternatives to craniofacial reconstruction in the treatment of birth defects, traumatic injuries, or disfigurement resulting from cancer surgery. DNA analysis can be used together with craniofacial reconstruction to help identify badly disfigured or damaged human remains. See also Cleft lip repair ; Fracture repair . "Chromosomal Abnormalities." In Section 19, Chapter 261 in The Merck Manual of Diagnosis and Therapy, edited by Mark H. Beers, and Robert Berkow. Whitehouse Station, NJ: Merck Research Laboratories, 1999. Colucciello, Stephen A., MD. "Maxillofacial Trauma." In Chapter 138 in The Emergency Medicine Reports Textbook of Adult and Pediatric Emergency Medicine, edited by Gideon Bosker. Atlanta, GA: American Health Consultants, 2000. "Musculoskeletal Abnormalities." In Section 19, Chapter 261 in The Merck Manual of Diagnosis and Therapy, edited by Mark H. Beers, and Robert Berkow. Whitehouse Station, NJ: Merck Research Laboratories, 1999. Nafte, Myriam. Flesh and Bone: An Introduction to Forensic Anthropology, Chapter 7, "Reconstructing Identity." Durham, NC: Carolina Academic Press, 2000. Cordeiro, P. G., and J. J. Disa. "Challenges in Midface Reconstruction." Seminars in Surgical Oncology, 19 (October–November 2000): 218–225. Eppley, B. L. "Craniofacial Reconstruction with Computer-Generated HTR Patient-matched Implants: Use in Primary Bony Tumor Excision." Journal of Craniofacial Surgery, 13 (September 2002): 650–657. Eufinger, H., and M. Wehmoller. "Microsurgical Tissue Transfer and Individual Computer-aided Designed and Manufactured Prefabricated Titanium Implants for Complex Craniofacial Reconstruction." Scandinavian Journal of Plastic and Reconstructive Surgery and Hand Surgery, 36 (2002): 326–331. Girotto, J. A., et al. "Long-term Physical Impairment and Functional Outcomes After Complex Facial Fractures." Plastic and Reconstructive Surgery, 108 (August 2001): 312–327. Hunt, J. A., and P. C. Hobar. "Common Craniofacial Anomalies: The Facial Dysostoses." Plastic and Reconstructive Surgery, 110 (December 2002): 1714–1725. Kos, M., et al. "Midfacial Fractures in Children." European Journal of Pediatric Surgery, 12 (August 2002): 218–225. Leong, K., C. L. Nastala, and P. T. Wang. "Cosmetic Aspects of Cranial Reconstruction." Neurosurgery Clinics of North America, 13 (October 2002): 491–503. Lorenz, R. R., et al. "Hydroxyapatite Cement Reconstruction in the Growing Craniofacial Skeleton: An Experimental Model." Journal of Craniofacial Surgery, 13 (November 2002): 802–808. Moreira-Gonzalez, A., et al. "Clinical Outcome in Cranioplasty: Critical Review in Long-term Follow-up." 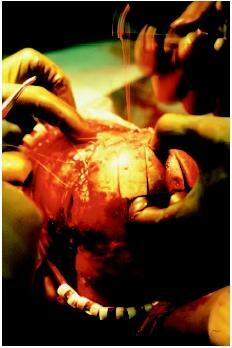 Journal of Craniofacial Surgery, 14 (March 2003): 144–153. Papadoupoulos, M. A., et al. "Three-dimensional Craniofacial Reconstruction Imaging." Oral Surgery, Oral Medicine, Oral Pathology, Oral Radiology, and Endodontics, 93 (April 2002): 382–393. Parsa, Tatiana, Arthur Adamo, and Yvette Calderon. "Initial Evaluation and Management of Maxillofacial Injuries." eMedicine, August 28, 2002 [March 8, 2003]. Rusch, M. D., et al. "Psychological Adjustment in Children After Traumatic Disfiguring Injuries: A 12-month Follow-up." Plastic and Reconstructive Surgery, 106 (December 2000): 1451–1458. Sarwer, D. B., and C. E. Crerand. "Psychological Issues in Patient Outcomes." Facial Plastic Surgery: FPS, 18 (May 2002): 125–133. Strumas, N., O. Antonyshyn, C. B. Caldwell, and J. Mainprize. "Multimodality Imaging for Precise Localization of Craniofacial Osteomyelitis." Journal of Craniofacial Surgery, 14 (March 2003): 215–219. Thompson, A., and G. Kent. "Adjusting to Disfigurement: Processes Involved in Dealing with Being Visibly Different." Clinical Psychology Review, 21 (July 2001): 663–682. Vanezis, M., and P. Vanezis. "Cranio-Facial Reconstruction in Forensic Identification—Historical Development and a Review of Current Practice." Medicine, Science, and the Law, 40 (July 2000): 197–205. Yucel, A., et al. "Malignant Tumors Requiring Maxillectomy." Journal of Craniofacial Surgery, 11 (September 2000): 418–429. American Cleft Palate-Craniofacial Association. 104 South Estes Drive, Suite 204, Chapel Hill, NC 27514. (919) 933-9044. http://www.cleftline.org . Federal Bureau of Investigation (FBI), Laboratory Division. J. Edgar Hoover Building, 935 Pennsylvania Avenue, NW, Washington, DC 20535-0001. http://www.fbi.gov/hq/lab/labhome.htm . National Down Syndrome Society (NDSS). 666 Broadway, New York, NY 10012. (212) 460-9330 or (800) 221-4602. http://www.ndss.org . Tuncay, Orhan C., M. Nuveen, C. X. Nguyen, and J. Slattery. "The Development of a System for Three-Dimensional Imaging and Animation of the Craniofacial Complex." Greater Philadelphia Society of Orthodontists Newsletter, June 2000 [March 24, 2003]. http://www.gpso.org/newsletter/3d_imaging.html . Craniofacial reconstruction of congenital abnormalities requires a team of medical specialists, including plastic surgeons, maxillofacial surgeons, neurosurgeons, dentists, ophthalmologists, and psychiatrists. These procedures can be done in a department of plastic surgery in a teaching hospital; increasingly, however, they are being performed in separate clinics or institutes that specialize in craniofacial reconstruction in children. Craniofacial reconstruction following trauma is started as soon as possible once the patient's general condition is stable. Although at one time surgeons delayed the treatment of disfiguring injuries for several weeks, recent studies have found that early treatment gives better results as well as minimizing the need for revision plastic surgery. These procedures can be started in a hospital emergency room or done in a specialized trauma center. Facial injuries resulting from burns or electrical trauma may be treated at special burn centers. Craniofacial reconstruction following cancer treatment is done in specialized departments of plastic and reconstructive surgery within larger hospitals. Many of these are teaching hospitals associated with major medical schools. Forensic craniofacial reconstruction is done in specialized facilities in university departments of anthropology or in laboratories related to the criminal justice system. Am I likely to need further surgery after recovery from craniofacial reconstruction? How normal can I expect to look at the end of the process? What are the risks of permanent damage to my eyesight or hearing? Does the hospital or clinic have a support group for people who have undergone craniofacial reconstruction? We have a six year old who had a complete bi lateral who we think looks good after his on going surgeries, but he is having anxiety problems , has just started being upset over looking different and we would like to find a support group with other children with clefts and thier parents. I you could provide any such information we would be forever greatful. We reside in frederick maryland. Thanks in advane for any help that you may provide. Since January 30 2008, I have begun the long, arduous process of multiple craniofacial reconstructions. Upon writing this entry, I have had only 3 operations out of what possibly could be a total of 10 to 12 to replace my mouth and nose. All the while, I have been experiencing a frightening roller coaster of emotion. Before my first surgery, I asked my surgeons most of the questions this article recommends to ask. My doctors had only blunt, cold, clinical, inhumane answers to questions that were for me as emotional as they were life-altering. They said, "You will never look normal again." "People will stare...and you will psychologically adjust." When I asked them if I'd ever be able to smile again, they responded with a long, awkward silence, and then said stoically, "You WILL be able to express happiness." As if that were any conciliation!! You see, I have public medical insurance (Medicaid), and I am a former drug user (which hypothetically was the cause of my terrible infirmity in the first place). Consequently (with regards to my treatment by these world-class, reputed plastic surgeons), I am feeling slighted & betrayed by my doctors. I feel like they are treating my case with less urgency and seriousness, because they think that I am a lost cause, a second rate citizen. As of yet, their sterling reputations as the best plastic surgeons in my state truly belie them and this reality. Right now, I feel like a monster! I rarely go out in public, and when I do, I am forced to wear surgical masks to hide my horrifying visage from cruel, insensitive bystanders. I'm in serious need of help: help coping, help adjusting, help surviving, help overcoming my shame. I write all of this as a plea for help, for assistance. Where might I be able to find psychological support for my ongoing struggle to cope with facial disfigurement? Where might I find talented, experienced, empathetic surgeons who are compassionate and honest enough to handle my treatment with excellent, gentle care? Surgeons who are willing to operate on a member of the social underbelly of a cosmopolitan city without prejudice? Where may I once again find hope and dreams and inspiration and pride and courage and confidence and stability for/in myself? Is there anyone out there who can help? Please respond to this comment with advice, emotional support or reassurances! I'd appreciate any gesture of kindness, understanding or sympathy at this point. Thank you! Blessings to all. I am 25 years old and I have an asymmetrical skull that is noticeable on the back of my head, it is flat . It really makes my life difficult. I wish the surgery is possible to fix it. Could you please give me any advice. Thank you doctor very much. My son has aperts syndrome and is awaiting cranio facial surgery to advance his forehead and midface sections of the skull. What risks are there in this surgery, especially in regard to possible death, infection and blindness. He is 12 yrs old. we live in paris forgive us for our English my son is 15 and very complex in the form of silly bald and flat and very parietal hump developer I want to savor if it was possible to reduce the hump shape of parietal and if surgery was not very complicated. I have a baby who is now 5 weeks old. He was born without nose and eyes. We live in Finland and our baby is "one of the kind". And that´s why doctors don´t really know what to do or how to operate him. Baby breathe and eat himself. He have low cortisol. I´m REALLY concerned about my baby`s life and I would really, really like your help, please. THANK YOU!!! Hi My name is Sophia. I had a car accident on July 3 of 2011 my skull was broken and most of the bones of my face, I had my left eye remove and my left side of the face is kind of paralys. I feel like I have 2 faces isted of one i would like to smile again please help me...I live in houston TX . I am Luckes my baby has crozone syndrome.who is now 5 years old.we done Craniofacial surgery when he was 3 years. but still not improvement. so we consult another Doctor. he said he can to do Lefort III surgery. but it is very expensive surgery. one Distractor 7500 US dollar they need 2 Distractor its a 15000 US dollor we need and surgey charges 3400 US dollar almost 17400 US dollar we need. it is very high to us. we have only 2000 US dollar. how can done this surgery cheapest rate or how can get the fund from donor organization. please help me to this difficulties. Hi i am 27yr old male. I had an accident @ age of 12 where i fell at least 5-6ft in the air on the back of my head on concrete. Ovwr the years i notice the mishaping of my head. Its shape differently on both sides. Is there anything that can be done eventhough its been at least 15yrs? My name is Abdul Karim. I am 28 years old and a Crouzon Syndrome patient. I had a skull operation at infancy age because of my skull was not completed so doctors did surgery on me and it went successful. Now, since birth I have bulged eyes, different nose shape and my teeth and jaws are crowded. My upper jaw is backward. My skull shape is also different. I have a hearing, breathing and speaking problem too. I have learned about this crouzon syndrome late as my doctors never mentioned or told me that I am crouzon. Now I would like to solve my problems and also solve my facial. I would like you to advice and guide me that what solutions do I have? Please guide me. I got bruise in the middle if my foreheaf after getting hit by stick .after one and half month my bruise is resolved but mark of bruise are still on my forehead and my fotehead is swelling still and iam felling dent from hairline to eyebrow in the vertical manner.and iam finding my forehead uneven.do I need to ho through operation procedure or it will heal on its own. My son was hit in the head with a softball crushing his eye socket which required plates and screws to repair it. My wife and I believe that he may have other problems but I'm told he can't have an MRT or CT scan to see what is going on. He now has anger, drinking, paranoid thought, reasoning problems, and other issues. His whole personality has changed and we feel something is wrong with his head but do not know what to do. This accident happened about 20 years ago, so if you could give us some answers we would be so thankful. Most teaching hospitals have craniofacial anomalies centers which have all the relevant clinicians review and coordinate care. Request a team appointment. Or call the Craniofacial Anomolies Coordinator, typically a nurse practioner, and discuss your Heath issues with him or her. They could advise you on the next step. I have a severe facial (and body) asymmetry. I want to see a specialist to see if my facial features can be correct ? People have hard time staring at me in the eyes because of the unevenness and I too have difficult time looking at people for more than 30 secs. It is affecting my daily activities and including my interactions with patient (nursing student). any feedback for me ? I will like to speak to someone in personal. I look forward to hearing from you. Thanks in advance.